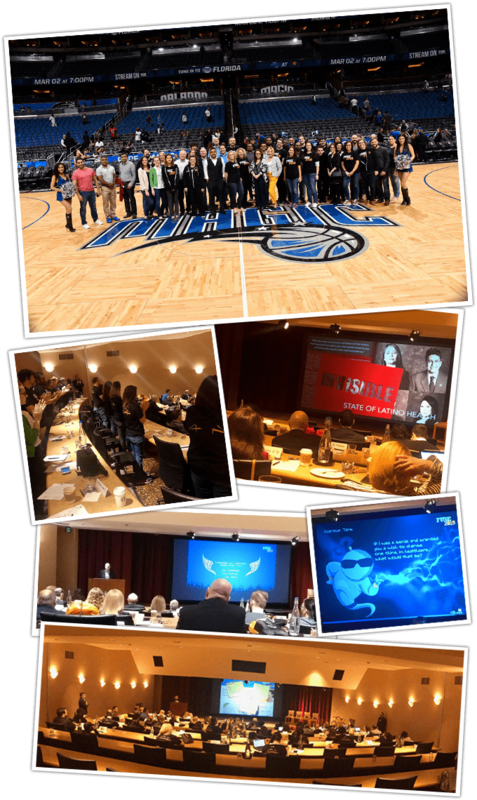 Three words that encompassed our 7th annual FUSE client user conference were: Inspiration, Evolution and Innovation. This year, FUSE took place on February 28, 2019 at the Hyatt Regency Orlando International Airport. The location being right on-site at the airport made it very convenient for our speakers, partners and guests to relax and enjoy their time without worrying about logistics. The day began with an exciting welcome from our Customer Success Officer, Sue Rohr and a special address by Dr. Phil Frost, CEO and Chairman of Opko Health. Dr. Frost discussed his positive relationship with The Garage and requested that “we continue to make magic happen in value-based care.” This inspiring message was followed by the keynote by our CEO and Founder, Pranam Ben. Pranam’s keynote presentation discussed, “How we are changing the game” in value-based care through our platform, culture, evolution, customer success and innovation. Pranam also explored areas that inspire The Garage to become the best in the space. Throughout his speech – and the FUSE 2019 agenda – one message was clear: our clients inspire us day after day to be better and do better. This message was underscored by a morning session title, Customer Story Lines That Made a Difference, where members of our Garage crew and clients together discussed their unique journey through population health management and how our team, culture and platform works with our clients and partners every day to make the difference in achieving the triple aim. To highlight a few, Anne Kauffman Nolan from Hudson River Healthcare noted that working with The Garage has not only made a difference in accessing data and information, but that they are looking at the right type of information. Throughout this segment, we got in-depth insights into the unique and impactful work our partners are doing. We at The Garage are humbled and truly inspired by many things, but mostly our clients. Our morning session continued on a high note with the announcement of our special partnership with SOMOS Community Care, New York’s largest multicultural physician network serving more than 2 million lives throughout the Bronx, Queens, Manhattan and Brooklyn. This terrific news was presented by our dual guest speakers Dr. Ramon Tallaj, Chairman & CEO of SOMOS and Mr. Henry R. Munoz III, Board Member & Leader of Cultural Design with SOMOS Community Care. We’re thrilled to be a part of SOMOS’ mission to reinventing the health care system in New York and helping to bridge the gap between providers and patients by optimizing care quality and operations across multiple high-risk management programs in the state’s most vulnerable neighborhoods. Their presentation and speech were so inspirational and moving to our audience that it received a standing ovation. Following this rousing presentation, our very own Jessica Robinson, Chief Platform Officer, didn’t skip a beat while providing an exciting overview of our comprehensive platform updates, including new functionality for reports and analytics, and how we’re doubling down on AI to make your life easier and your processes more intuitive than ever before. The afternoon program continued with one of our fun-filled FUSE staples, Garage Tank. This year’s challenge posed the question, “If I was a genie and granted you a wish to change one thing in healthcare, what would that be?” to our randomly selected groups while the judges waited to respond to each group presentation with humor and realistic healthcare insights. Each group gave impassioned speeches about areas including the state of healthcare, problems with access, and convenience and cost. The well-thought-out and energetic responses we received after just 10 minutes of deliberation for the teams were indicative of how much these executives care so deeply about improving the industry and their patients’ lives. To no surprise, each group presented such a strong case for change with valuable solutions, so we were honored to reward three different donations to the following healthcare-related non-profits of each groups’ choosing: Alzheimer’s Foundation of America, Coalition for the Homeless of Central Florida and The Warwick Area Migrant Committee Children’s Summer Camp Program. After envisioning our ideal healthcare world in the Garage Tank, explored the Future Unleashed, which used an Avengers-themed presentation to showcase our upcoming innovations to our platform offerings and digital solutions. Each new piece of innovation represented a different gem on the “Infinity Gauntlet” so healthcare organizations can be armed superheroes that serve their communities. The final session of the day was an insightful Industry Panel Discussion which included a brain trust of senior leadership from top ACOs, MSOs and FQHCs, including James Sinkoff of Hudson River Healthcare, Dr. Sidd Pagitipati of Select Physicians ACO and Physician Partners, and Dr. Alex Foxman from National ACO. Among other things, the panel discussed why tackling social determinants will be the “holy grail” of population health management and the struggle providers and payors face when it comes to the role in overcoming social determinants. We ended the segment with an engaging Q&A discussion with audience members discussing their experiences with these topics. Once the action-packed sessions were complete the evening was reserved for a night of dinner, comedy, sports and a photo-op. The evening featured a locally catered Mediterranean style dinner followed by multiple improv comedy skits performed by local comedians from SAK Comedy Club here in Orlando. To top off the night, we headed to the Amway Center for a thrilling game between our hometown Magic vs. the reigning NBA champions, the Golden State Warriors. We enjoyed a group photo on the court after the game ended in a final score of 103 – 96 in favor of Orlando, a culmination of a truly magical day and night! FUSE 2019 brought forth new ideas, renewed interest and excitement for what we’re all doing in healthcare and continued to remind The Garage why we’re so inspired to work with our users every day.